Foods that belong together: Peanut butter and jelly. Cheeseburgers and fries. Bacon and eggs. Fish and chips. Steak and potatoes. Spaghetti and meatballs. Chicken and rice. Ice cream and … anything. Foods that don’t belong together: Potato chips crisps and dill pickles. 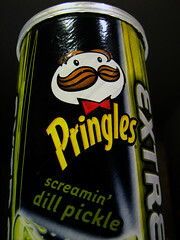 I love Pringles, but these are inedible. Consider yourself warned. We spent the $1.25 so you won’t make the same mistake. You’ll thank me later.